Handmade in the United States, this eco wool and certified organic cotton comforter is designed for people living in a climate where temperatures change dramatically between winter and summer. This product is composed of two cool comfort comforters that can be tied together or separated, allowing you to take one off when the warm weather arrives. Cool comfort is a temperature weight best suited for a hot-natured person, for more than one person sleeping in a bed, or to be used in combination with additional blankets. 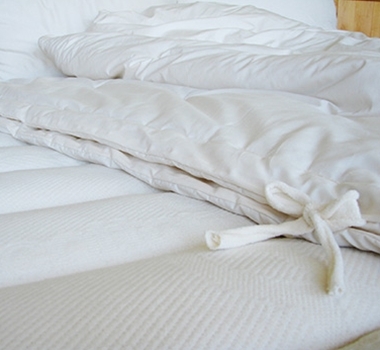 When combined, the two comforters create a remarkably warm and cozy sleeping arrangement for those cold, winter nights. With organic cotton threading, the entire perimeter is hand-stitched and hand tuft every 6"-8" to prevent the wool from shifting. The wool in this product is sourced in the Pacific Northwest of the United States from farmers who participate in the Sustainable Wool Program, producing high quality ultra clean wool from sheep flocks that are managed in a humane ethical way and in a chemical-free thoughtful environment. Wool is a wonderful chemical-free bedding material which naturally wicks away moisture, helps to regulate tempurature while sleeping and does not harbor dustmites. The certified organic cotton is grown pesticide-free the way nature intended it to be. Clean only according to special instructions provided.